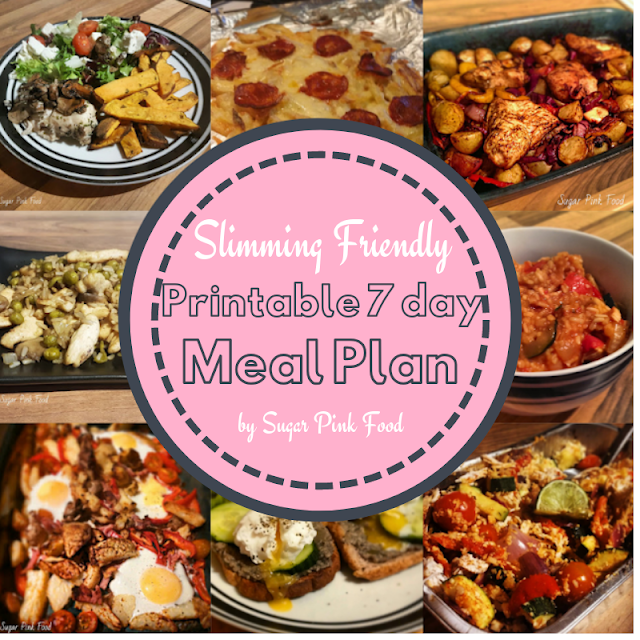 The key to keeping on plan and on track for me, is to make and stick to a meal plan. Sure, it can take time, but in the long run it saves so much time. There's nothing worse than coming home from work and having to work out what to have for dinner and how many syns you have left etc. Want the shopping list for this plan? Download it here! Want to print this meal plan out? Download and Print it here! All syn calculations are my own, and are for guidance only. I am not affiliated with Slimming World in any way, other than having followed the plan myself. Always double check the syns, as there are constant updates. Don't forget to syn anything you eat outside of this plan accordingly, and add plenty of 'speed food'. This is a plan that I followed myself and had success on! Thinking of trying out this recipe? If you do, I would love to see a picture of your creation! @SugarPinkFood on Twitter, @sugarpinkfood_sw on instagram or Sugar Pink Food on Facebook! All syn calculations are my own, and are for guidance only. I am not affiliated with Slimming World in any way.